View More In Cases, Holsters & Sleeves. The Zuca Flyer Artist Travel Carry-on Luggage - something new for the highly evolved business traveler. This is the anti jet lag bag. 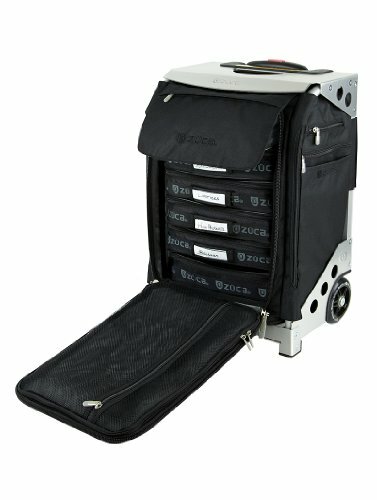 The Zuca Flyer Artist is part carry-on, part organizer, and part Darn, is this thing cool! Features a built-in seat and removable packing pouches that stack like drawers. This patented new concept in travel is like nothing else. Period. The Zuca Flyer Artist fits comfortably into overhead bins, and comes with a TSA-friendly toiletry bag. The comforts of home. You can take them with you with this new Zuca Flyer ensemble. The Zuca Flyer Artist Travel Carry-on Luggage - something new for the highly evolved business traveler. This is the anti "jet lag" bag. The Zuca Flyer Artist is part carry-on, part organizer, and part "Darn, is this thing cool!" Features a built-in seat and removable packing pouches that stack like drawers. This patented new concept in travel is like nothing else. Period. The Zuca Flyer Artist fits comfortably into overhead bins, and comes with a TSA-friendly toiletry bag. The comforts of home. You can take them with you with this new Zuca Flyer ensemble.